I'm honoured to have been nominated for the "Very Inspiring Blogger Award" by Hailey over at Striding Strong - thanks so much, Hailey! Hailey is a true inspiration herself: She has some very impressive podium race finishes under her belt and clocks some serious weekly mileage, but in the process listens to her body and is one of the most disciplined runners I know. And despite her amazing talent, Hailey remains humble and down to earth - head on over to her blog and be inspired! 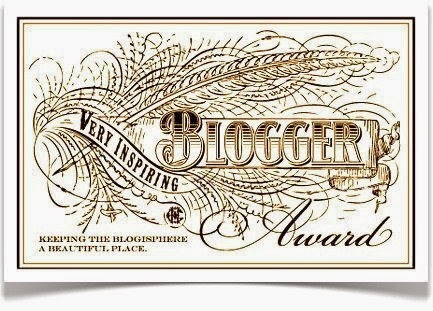 Nominate 15 other amazing blogs and comment on their posts to let them know that they have been nominated. Poor Will also often has to tell me to lay down in the middle of the night when I suddenly sit up straight and start babbling in my sleep, ha! This is actually a bit out of control...! I even get a little upset (but keep smiling and nodding...) when people tell me that "they also love chocolate" and I know that they're actually referring to milk chocolate and not dark chocolate... To me that's like comparing instant coffee to the filtered kind - it just shouldn't be done. Yes, I'm a bit obsessed. Sure, a brewing pot of filter coffee smells amazing, but I just don't like the taste. And I haven't had a (forced) cup in about a decade or two. When I was a little girl, my mom used to wake us up with a cup of coffee each morning, but I remember asking her not to bring me coffee anymore when I was about 12 or 13. Still not a fan. I want to turn everything into a (friendly) competition. Very irritating to non-competitive types, I know. Not sure why, either - I think that competition just motivates me? Fortunately I married the King of Competition himself - Will has no problem with continually trying to see who can run the furthest/do the most push-ups/plank the longest... (And of course I always come out second best against him - pfft.) Yes, we're strange like that. My partner in crime competition. Sometimes I think that I missed my calling and that I should have become an army sergeant or something... No idea why, but I love army-style workouts: Grunting my way through push-ups, burpees, lunges and squats (super feminine, I know, ha!). I'm also very keen to try out the obstacle racing scene - I think I'll love it! I've had an urge to travel to foreign countries since I was a little girl. In high school I used to wish with all my might that our school choir would go on an international tour, but, of course, we never did. I've since been blessed to visit a few countries, including Namibia, Botswana, Zimbabwe, Zambia, Lesotho, France and the US. There's just something wonderful about seeing and realising that your way of doing and living is not the be-all and end-all. And to learn from others who do things in ways very different to yours. And, of course, realising, as you return home, that there's no place like it. 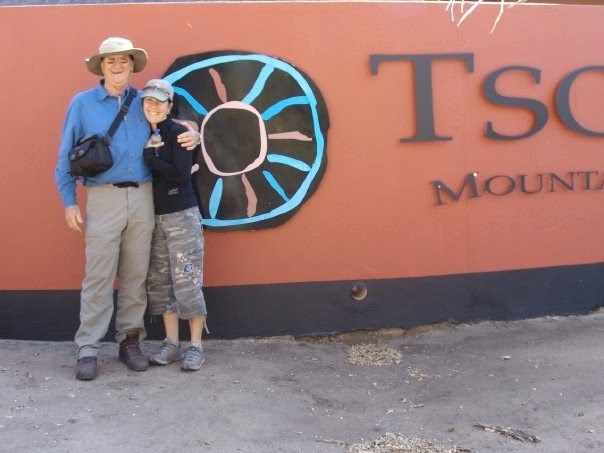 Visiting Tsodilo Hills in Botswana with my dearest dad. Precious memories! To me realising the blessing of and appreciating things that money can't buy is what life is all about. My children, my husband, family silliness, hugs and time spent together - these things make me truly rich. (Some of) my people. Truly rich! Moerieda started running later in life and is loving every minute. She completed her first Comrades Marathon this year (with a huge smile on her face!) and is aiming for even bigger things in future. 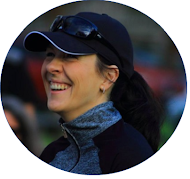 A lovely person and inspirational runner - give her blog a follow! Any random things about yourself to share? Do you like coffee/dark chocolate? Any fellow sleepwalkers out there?! I KNEW I was going to see something about chocolate for one of your facts ;) It's so funny that we're opposite with the whole coffee/chocolate thing. I don't really like chocolate unless it's in something. I think dark chocolate and mint is the best combination though. And I love your number 7, so very true :). Wow, that's quite scary about your brother - luckily your mom caught him in time. I really don't hope my children get my sleepwalking tendencies! I contemplated leaving out the dark chocolate bit, because I know it must be getting a bit much [;)], but it just wouldn't be me without it, hehe! I love how everyone's taste differs (you love coffee - I don't drink it at all) - how boring the world would have been if we all loved the same things! Loved your answers. :) And I complete agree - I'm NOT a coffee drinker!